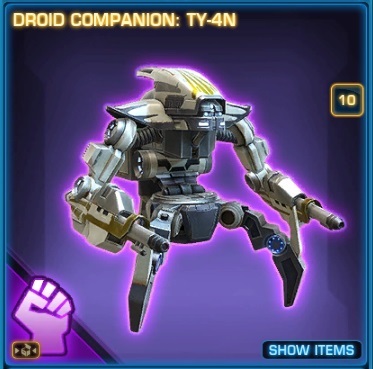 I've mentioned not long ago that I very rarely even look at the Cartel Market, but this past weekend a promotion on the launcher caught my eye: the "Grand Companion Pack", which was guaranteed to grant you a type of combat companion that's usually only available as a rare drop from a Cartel Pack. "Oh," I thought, "maybe I can finally get an Akk Dog. They're pretty cute." I did eventually get one, but since it was still subject to some RNG, not before I ended up with a whole slew of other companions, including many duplicates. What to with all those droids and beasts? Well, I've been meaning to run another giveaway for a while, so why not use them for that? I feel like I should be giving back to the community anyway, considering that most of my Cartel Coins are generated by people clicking my referral link. 1. You need to have a character on The Red Eclipse. Sorry, but it's a practical limitation as that's simply where I've got these things lying around, and I'm not going to start server-transferring just to give stuff away. 2. Leave a comment in response to this post telling me which one of these ten companions you'd like to win and why. Example: "I'd love to win the ISO-5R because somehow it manages to look ridiculously cute for a killing machine!" You can only choose one, so choose wisely. Or, you know, you could hedge your bets and pick one that you think is unlikely to be picked by anyone else, therefore making you the default winner. 3. At the end of your comment, leave your character name and faction (of the char on TRE). This is so I know where to send your chosen pet if you win! This doesn't have to be your main if you're shy, just somewhere where I can mail the prize so that you will actually receive it. 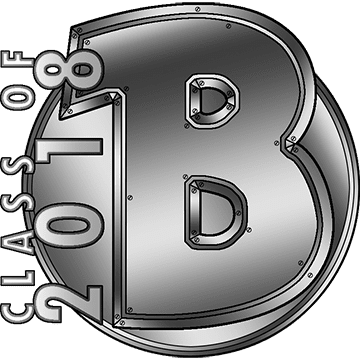 The blog is set up to allow anonymous comments, so as long as you can cope with CAPTCHAs you don't have to sign up with any third party service to participate. However, should you still have issues commenting on this post for some reason, feel free to drop me an e-mail with what your comment was supposed to be and I will post it for you. Each of the ten companions will be randomly given away among the number of commenters who picked it as their favourite. You have until 6 am GMT on the 27th of March to enter, at which point I'll close the comments for this post and announce the winner later in the day. I NEED that Tuk'ata because you can teach him tricks and I want mine to beat out Jason from CRR for Best in Show! Also I have always felt bad for the Tuks since I found that dreadful scientist experimenting on them on Korriban. Also I follow directions REALLY badly. My TRE main is Starviolet on Pubside. 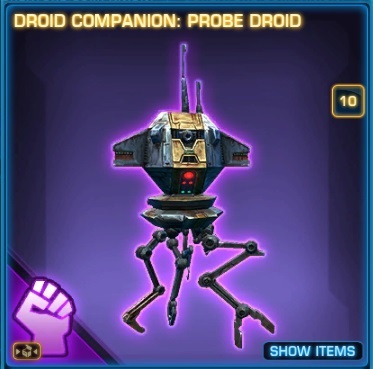 I think my agent would love the Probe Droid. It could probe all his enemies' minds, extract information, and help him protect the Empire from all kinds of Jedi and other dangerous elements. His name is Milivai Quinn and he resides on TRE on the Empire side. I think I'd have to go with H1-K1. Very Iokathi, and I think it'd make a wonderful playmate for M1-4X; the HKs are so snooty, after all. 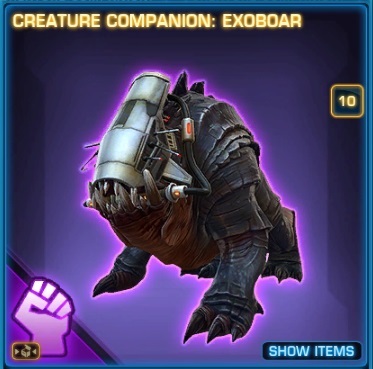 I choose the Exoboar, because i'd love to free him from his exoskeleton. This Makeb-Creature Needs to walk with dignity and pride. Only a few hours left. Good luck, everyone! Well I reckon ISO-5R. Lets be honest hes just a pet puppy really. I just need to put a tail on him so he can wag it while we bite some imps. The Nathema Beast looks good to me, sort of creepy but catlike and awesome. It would be great for intimidation. This is so cool! But it's sad that you had to open so many packs until you got that akk dog. As you know, I *really* want that akk dog. But I already spent all my cartel coins on that crazy expensive lightsaber for Conrad, because he really really really wanted it. I have a tough time picking just one out of these. 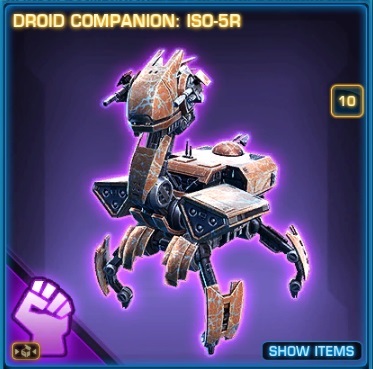 The Probe Droid and the Nathema Beast are my favourites. 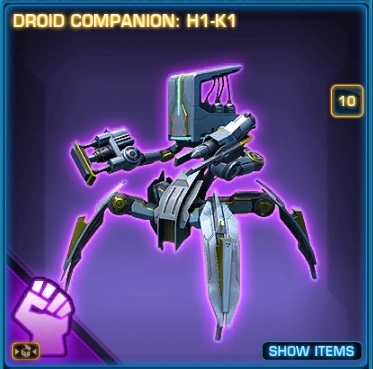 My sniper would use the droid, and I could legacy unlock it for others. 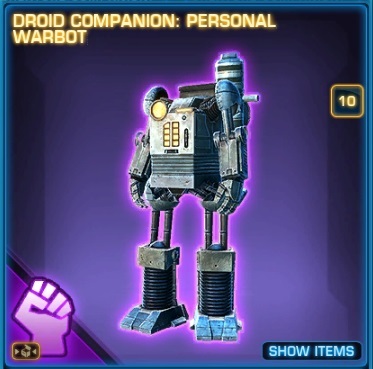 I always wanted a character that was super fond of droids, so a droid pet would be perfect! The Nathema Beast I would be perfect for my marauder, who is pure evil and wears black. But I don't like playing DS that much, so I don't play her that much. My plan was to wait for someone to comment one of the two so I'd go with the other. Well, that failed, because both have been mentioned already! So I'll have to pick after all. I put my bets on the Probe Droid. You're crazy! But crazy in a good way so thx for doing that giveaway ��. My half cyborg Mercenary Exiluminator would need a robo companion so TY-4N would be perfect for him! 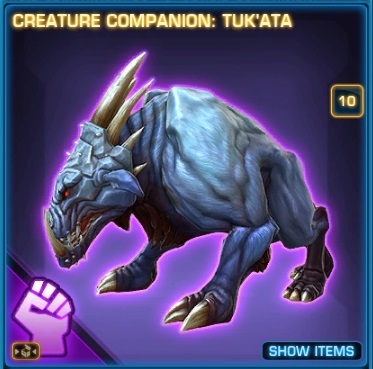 This doesn't change the fact that Tuk'ata is super cool, and I would love to learn him to fetch all kind of cool crystals and to annoy people with his bark/growl so much that they give money to me to stop him :P. Furthermore I think he looks really cool next to his new best friend the Charlie the Chemilizard. But I will give him better food than Charlie who only eats chemical waste. My Jedi Shadow A'rinka will take care of him really well. You are so amazing to do that! If I win I would be happy about the Nathema Beast! My Sanne Marr on Imp Side would do a happy dance! 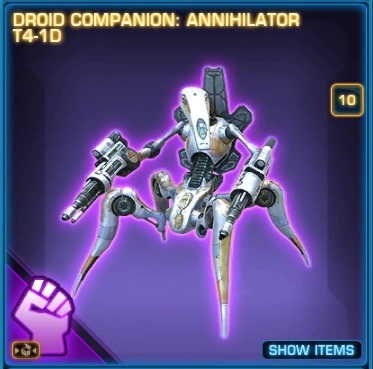 Annihilator T4-1D will look amazing with my powerful Sith Warrior. Together they will create a great undying team for destroying their enemies! TRE: Sith Juggernaut - Xoleras. Aw.... Nothing says "love" like a miniature Nathema Beast. I would love to win annihilator t4-1d, Ever since the colicoids tried to rip my agent's throat out by inviting her to compete in a wargame i thought hmmm. that's a cool droid. It would be wonderful if she could use that droid for her own evil ends. Also, it looks super cool! And thanks for running this giveaway that's a really nice thing to do. 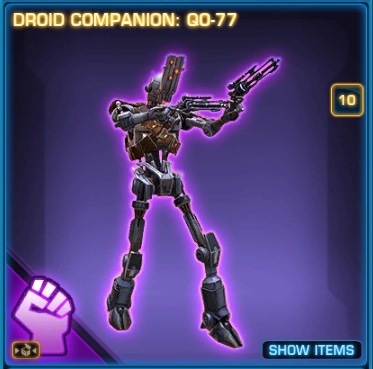 My bounty hunter would love QO-77, would look great alongside him. 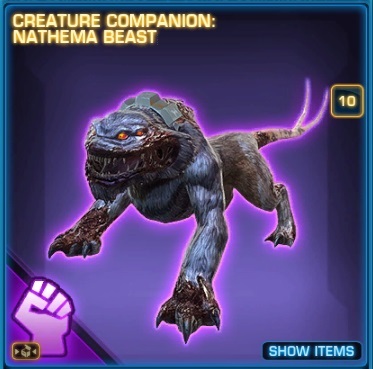 Nathema Beast would be great for my DS Jedi Knight. They could be creepy together and bond over being undead creatures messed over by Vitiate. It is alright, Shíntar. You are allowed to vote for your own companions. My Vanguard, Mardànt, would love to have ISO-5R as his sidekick. He looks like an adoreable, but deadly, puppy dog. Also, he reminds me of my adventures on Makeb way back in the olden days. Jellico here, got a unicode character on the i. Thanks to everyone who entered, and for coming up with interesting reasons to own some of these companions. Still giggling at the Cipher Nine portrait on Wookieepedia, and I really want to meet Charlie the Chemilizard now! I'm closing this now and will draw the winners later in the day (after work).